Yes, you read that right. 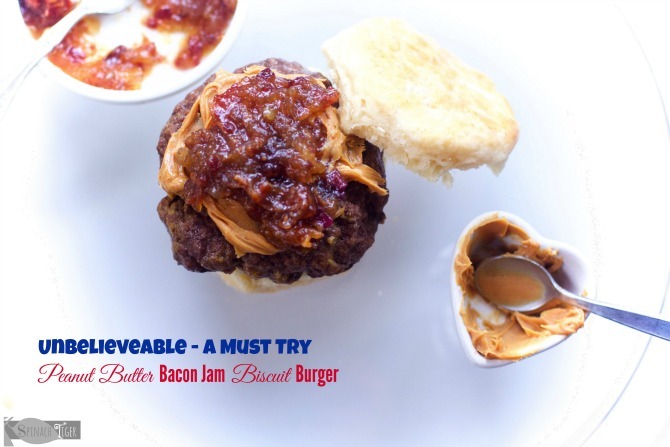 It’s a bacon jam recipe for a burger made with peanut butter, and it’s lip smacking taste heaven. It’s the bite that makes your eyebrows raise and your eyes close. It sounds strange, maybe even awful, but it’s not. It’s a perfect bite. It might even be my best bite of this year so far. I got the idea from a food truck at the Taste of Buffalo a few summers ago. I never forgot how good their bacon burger was and we all agreed it was the most memorable bite of the night. The Taste of Buffalo is the biggest of it’s kind in the country and yet stood out. That should convince you that this is a very worthy burger. The bacon jam, made is with shallots and maple syrup, is best if made the day before, giving those flavors time to meld. I’ve noted that if you don’t have apples, use peaches or nectarines. 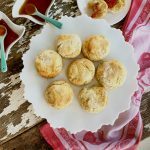 The angel biscuit is a yeast biscuit, perfect for sliders. It doesn’t fall apart and will hold up well. I preferred the creamy peanut butter, but feel free to use chunky if that’s your thing. I also flavored the ground beef with dijon mustard and Worcestershire sauce. Instead of frying the burgers, I cooked them slowly in the oven so they would be very juicy. Stay away from adding any cheese. 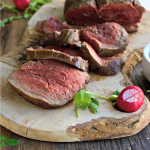 For a Paleo Option, use almond butter, and skip the biscuit. It’s still great. Make the grain free biscuit. For a Gluten Free Option, make the gluten free biscuit. How or why a biscuit burger? A burger was this month’s challenge for creative cooking crew. I wanted to keep the ground beef front and center and not go crazy with ten thousand piled high ingredients. Anyone can do that, but a really great burger is executed with balance and just enough toppings to fit into your mouth at once. I hate burgers that fall all over the place and look like a buffet table. 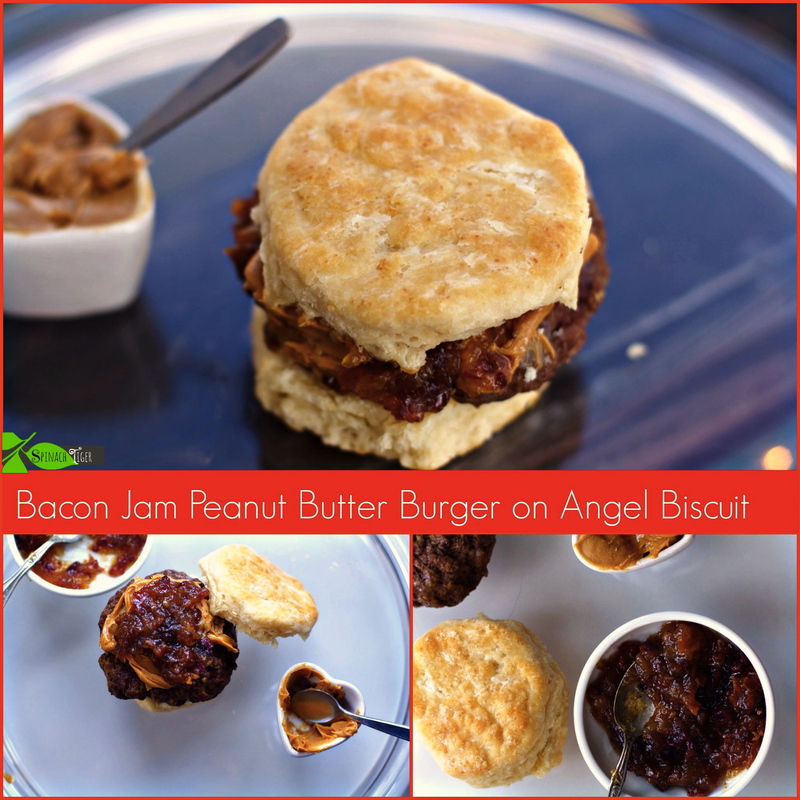 The bacon jam recipe brings it home when it tops the peanut butter. I’ve made bacon jam here before that was apple heavy and more sweet and sour. This is more onion/bacon flavor. 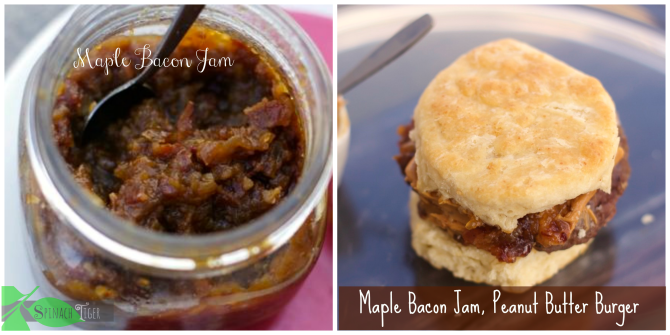 Both are good, but I really wanted a more savory bacon jam for my burger. This is the perfect “fun” burger for parties, if you dare! You could bake these or grill them. I wrote here about how to grill a great burger on the grill. Here is the angel biscuit recipe. Just in case you didn’t know this, I have just about a zillion recipes here for biscuits. I hope you check them out especially my Southern Fluffy biscuit, which real people have made over and over and wrote me to tell me about it. Here is a great tested gluten free biscuit. 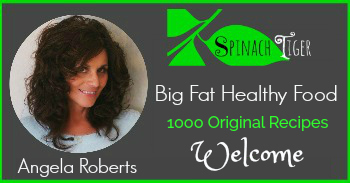 Here is a great grain free, low carb, paleo biscuit. Let’s Connect. Hearing from you is pure happiness. 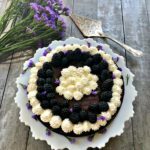 The tabs at the top give you lots of ways we can meet and I do hope you subscribe, and never miss a recipe. 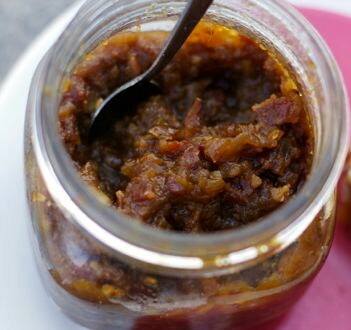 Bacon Jam made with shallots, honey, perfect to top a burger, grilled cheese, or a flatbread pizza. Cut bacon into 1 inch pieces. Fry in heavy bottomed pan until crisp. Drain. Save one tablespoon of bacon grease. Add shallots or onions to bacon grease. Soften for a few minutes. Add in garlic. Add apples, cook for a minute. Add in vinegar, brown sugar, cayenne pepper and saute until apples are soft. Add bacon back in until it looks like a compote. Add in apples, shallots or onions, garlic, cayenne pepper, vinegar, brown sugar and saute until apples are soft. Add bacon back in. Add maple syrup and cook down until it looks like a compote, about 45 minutes. I only cooked it very low heat for one hour. Pour off any bacon grease. This part is important. Process in food processor, but not too much. Pulse it and check to see that you can visibly see the bacon, as shown in the picture. Store in refrigerator up to a week. Note: If when cooking the compote down, it becomes too dry, add in some water. This is better when left in refrigerator for 24 hours. The flavors meld. You can substitute apples with peaches or nectarines. 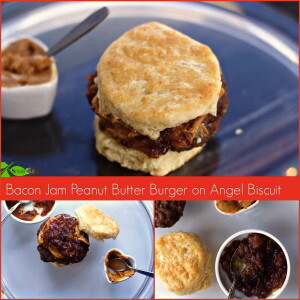 A peanut butter and bacon jam burger on an angel biscuit is a great party food. 1 pound premium ground beef. Mix the ground beef with mustard, Worcestershire sauce and season with salt and pepper. Form in to small flat patties that will fit the circumference of your biscuit. You can choose the size biscuit you want to make. Put burger on bottom biscuit half. Top with 1 tablespoon peanut butter. Top with 1 tablespoon onion bacon jam. Top with other half biscuit. These amounts for amount of meat will depend on how thick you want your burger. I suggest not too think since it's on a biscuit. I will trust you with the taste!! 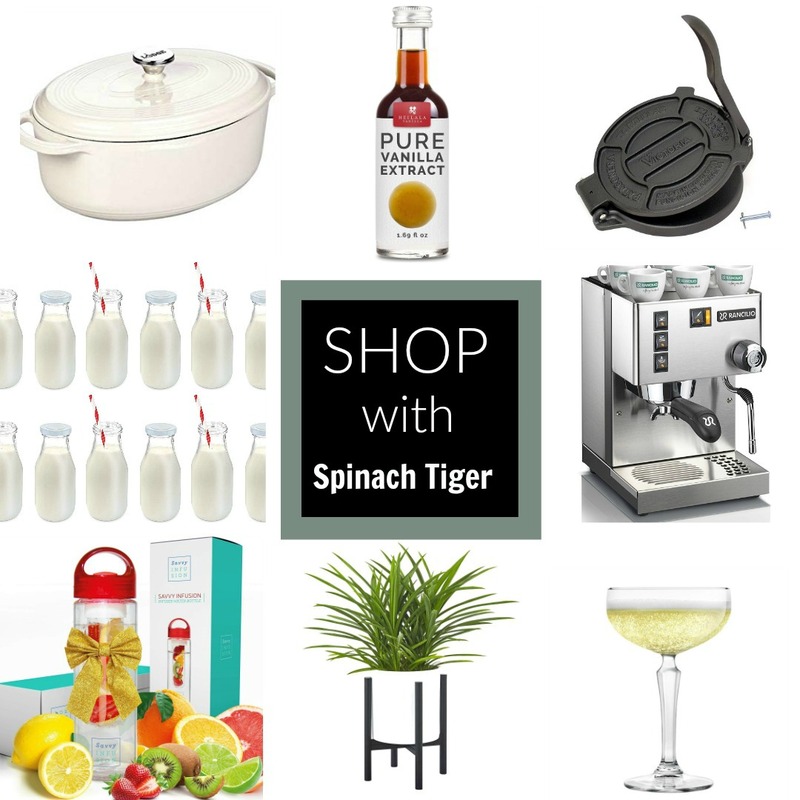 And I’m game for just about any kind of food — I will simply refuse insects and rodents and perhaps a few other things but this combination sounds great to me. Have a great weekend. Hey Angela, I thought I already commented but guess I didn’t! I love this, it all sounds great. Trying to imagine the peanut butter with worcestershire sauce and mustard with the peanut butter as a savory component! Make one for me please? Sounds yummy! I’ve had apple bacon jam before and it’s good; I’ll have to try this. This is a weird but interesting creation. I want to make it. I’m curious to see if my family will eat it. This idea is fascinating. I can’t really get my brain wrapped around it, honestly: and by that I mean, I’ve tried to imagine what it might taste like, but, I’m failing. I think I’m just going to have to try it, to find out. MY MOUTH IS WATERING! YUM! I think I died and went to heaven just reading this! Get in my belly! YUM! I’ve only use pre-made bacon jam so I need to try this! 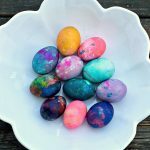 This has got to be one of the most unique recipes I have seen in a long time! 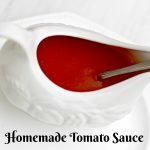 It is something I would have never put together, but reading the recipe…it does sound good! Jamie I feel the same way. I would never have put this together, but it was so good when I first tried it. You had me at Bacon Jam but then you threw in a yeast biscuit. YUMMY! I am trying to learn to cook and this will go on the dream list. I’m so happy you’re learning to cook. You can contact me anytime with questions. That looks so good. I want to eat that right now! WOW! As a 16 year vegetarian, even I AM impressed and intrigued. 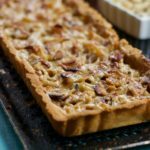 Though this will never pass my lips, I would love to make it for a unique surprise for my meat eating, bacon LOVING family! Thanks for something new and fun! Krysta, thank you . Coming from a vegetarian, that’s nice to say. Oh my goodness, but this sounds out of this world! And the shallots are genius. I have GOT to try this. Thanks! It doesn’t sound “crazy” to me. You’re right — it’s about balance and reading your recipe, I think you accomplished that very well. If I was in a restaurant and saw this on the menu, I think I’d have to try it. Well done for the challenge.